Are you all rested-up from the weekend and ready to resume My Favorite Things?! Me, too! If you're looking to teach your child chess but have no clue how to do it, then Giveaway #4 is for you! 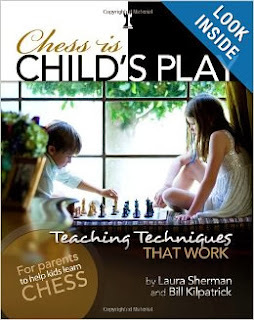 My family LOVES Chess is Child's Play, and Laura Sherman's teaching techniques are working for us! Mary is learning to play, I'm not stressing (the book tells you what to say), and we're having a great time together! Please click here to read my full review (with pictures!) of this awesome book. Laura Sherman is generously giving away one copy of her book to the winner. This giveaway is open to U.S. residents only. Ready to enter?! Go for it! I think my dad taught me. However, we know no strategies. My daughter learned from No Stress Chess, but this resource looks better. I don't know how to play but God has put in my heart , that i shut learn and teach my 7 kids . Jacob has mastered checkers and has been talking about starting chess. He and his Daddy would have some much fun with this!!! I don't know how to play but have wanted to learn to be able to teach my sons. I learned when I was 10 or 12. We are really enjoying the game No Stress Chess with my kids right now. My husband and dad are GREAT chess players. I tried to play with my brothers when I was in jr. high but really learned from my hubs and F-I-L as an adult. My son is always asking to play chess, so this will help us both! I learned how to play in college! I don't know how to play...yet! I could definitely use this great book! Thanks so much for the wonderful review and giveaway. My husband and I both learned to play in our Elementary School chess club. It's been so long since we played, we'd love this resource to introduce the game to our children. I learned to play as a good but did not play often enough to remember now. This book looks great! I don't remember how old I was when I learned to play--maybe 10. I'd love to teach this to my kids and relearn myself. I don't have one of the different accounts--this is Kristine C.